She decide withouth a second though that she knew what to do. He was so troubled by it, even if he had gone with them on his own free will ... those eyes were so sad. And he couldn't lie to her. His happiness wasn't there, it never could be. She knew certainly that she had to bring him back and protect him from them, even from himself. From the bottom of her heart, she swore for it. 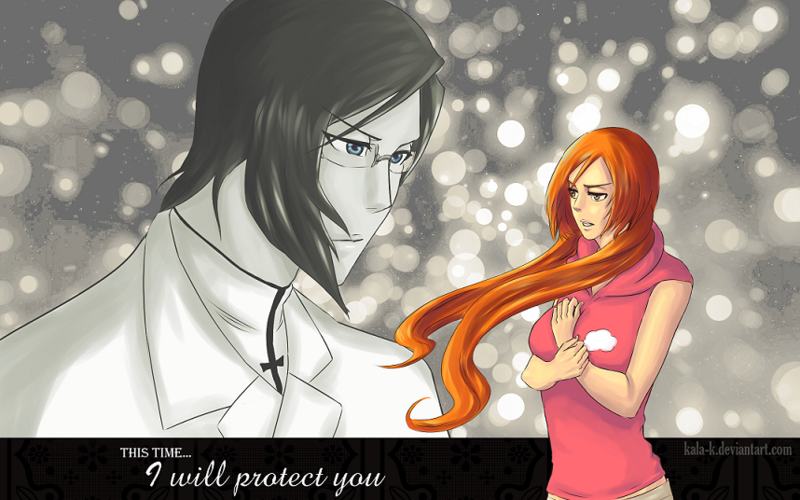 Thanks deary~ Orihime always looks prettier when being determined and ready to protect her love ones <3 She is such and amazing character whenver she act like this. Oh! The pun was on Ishida's name and it's meaning(Ishida = stone rice field). This is lovely! The composition on this one is really cool, and I especially like the B&W vs color. I also love the sentiment here, and I still hope to see this happen in the manga. And Debbie has given me another way to read my own fanart I didn't noticed and now that she mentioned, it looks like not only Orihime is making that promise but also Uryuu, even if his expression was though as one of sadness it also can be read as determination. Nice! I love how determined they both look, and the use of colour is really nice. Oh this is beautiful. I love the use of b/w ver. color here. I saw this first on Tumblr and gasped. It's always a delight to see what you're going to do next with your art. I'm really fond of Ishida's classic LOOK here--it's so devoted and beautiful and yes, protective.